Wallflower has partnered with Axis Communications to bring to market a sophisticated addition to the Wallflower Alive! Family. Building on our extensive experience with webcam based Facial Recognition systems Wallflower was well placed to benefit from the remarkable Axis Demographic Identifier. Competing systems rely on FR using webcams and either dedicated FR processors or powerful signage players. The Axis approach of using the security camera hardware to undertake the FR allows the Signage players to continue to be low cost units. By providing retailers with a dual-purpose device providing both Axis security camera functionality and powerful FR functionality this solution is the most cost-effective available. Linking in to the store Wallflower Digital Signage network the displays can automatically adjust their media to the prevailing demographics of visitors. If suitably located adjacent to an interactive device the demographics provided by the camera can configure the device to instantly deliver a targeted menu system. 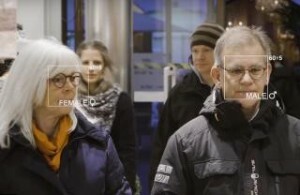 AXIS Demographic Identifier Smart analytics for determining gender and age AXIS Demographic Identifier is a cost-efficient and scalable video analytics application that detects and analyzes faces of store visitors, and displays their gender and approximate age. The application does not store images or video, so the personal integrity of customers is never compromised. When combined with AXIS People Counter statistics, the visitor information is valuable for merchandise and marketing optimization. AXIS Demographic Identifier data is also accessible from the camera’s web interface or in AXIS Store Reporter, which provides a clear graphical representation of the data. Optimises merchandising and marketing activities. With the advent of Wallflower Alive! the advertising experience really changes forever. If, in a POS queue equipped with a display, an older woman moves to the head of the queue, she may be shown adverts for holiday cruises. Teenage boys will be shown adverts for computer games maybe with some background music they want to hear. If a young woman comes to the head of the queue, she is shown appropriate lifestyle adverts for her age and gender. Wallflower Alive! builds a demographic profile of who watches the advertising, when and for how long. Wallflower’s AdWatch® module provides a wealth of statistics such as the number of people looking at an advert, the genders, and ages of viewers. This can be segmented by time and directly related to the adverts playing at the time. Wallflower Alive! knows when your customer is present and paying attention to your advertising or display area. Advertising can be streamed to begin only when someone is in the target advert area or actually looking at the display. A wealth of graphs and reports can be prepared allowing media planners to rapidly assess the effectiveness of campaigns. 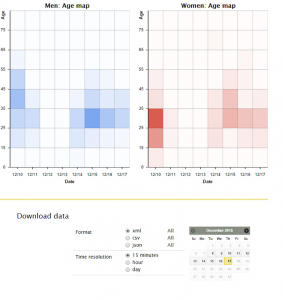 An intuitive interface allows slicing and dicing of results with drilling down to the underlying data.